Photographing tonight's Panamanian meal was a bit of a challenge due to the continuous rain, fog and generally dark, gloomy weather we've been besieged with here in the Northeast for the past 2 weeks. I have learned to photograph indoors using only available light (thank you, Jeff Kauck), but alas, without the lights on, my kitchen was practically pitch black. So...since I don't own any fancy lighting apparatus, I was stuck with what I had -- plain old light bulbs. Hence, tonight's photographs have a slightly pinkish tint for which I apologize. I did try shooting the final plate (pictured above) outside under the back door awning, but the rain kept dripping off the awning onto my back, my socks got soaked and our dog and cat kept creeping up on the plate to try to steal the goods - so I gave up and came inside. Luckily, these Panamanian Empanadas with Aji sauce taste as good on in the dark as they do on a bright, sunny day - which is a good thing because there's no sun in the immediate forecast. Officially the Republic of Panama, it is the southern most country in Central America and is situated on the isthmus, that connects North and South America. Originally settled by the Spanish in the 16th century, the country broke with Spain in 1821 and joined with Nueva Granada, Ecuador and Venezuela. When the union dissolved in 1830, it remained part of Columbia, but by 1903, it seceded from the country. Between 1904 and 1914, with backing from the U.S., the Panama Canal was built, which the country now fully owns and controls. Besides the Amazon rain forest, Panama boasts the largest rain forest in the Western Hemisphere, which is home to a many rare tropical plants, animals and birds, and undoubtedly some that have yet to be discovered. 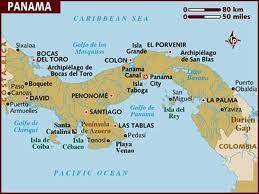 Cuisine in Panama is varied and interesting, as it is influenced by the two continents it bridges. African, Spanish, Native American traditions can all be found in many Panamanian dishes. Cilantro, maize, rice, wheat flour, plantains, yucca, beef, chicken and seafood are all commonly cooked with an eaten in this beautiful country. Combine four and salt in a large bowl and cut in shortening, using 2 knives or a pastry blender until it looks like pea-sized pieces - don't worry if it's not perfectly uniform. Mix with your hands and form into a ball. Wrap with plastic wrap and refrigerate for at least 30 minutes. Mix beef, pork, salt, pepper and cayenne together using your hands. Heat the oil in a large skillet and brown the meat well, then set aside. Add a little more oil if needed, and saute onions, bell peppers, chiles and garlic until soft. Return meat and pan juices to the pan. Add tomatoes, raisins, vinegar, thyme, allspice and nutmeg. Simmer until meat is tender, about 20 minutes, stirring occasionally. Add vinegar and pimento and simmer another 10 minutes. Beat the egg and water together. Remove dough from the refrigerator and cut in half, return half to the refrigerator. On a lightly floured surface, roll out the dough thinly. Add a generous portion of filling to the center of each circle. Fold the dough in half over the filling and crimp the edges with a fork. Pierce the tops of the pastries with a fork and brush tops with the egg/water mixture. Repeat with other half of dough, gathering up scraps until all the dough is used up. Bake in a preheated 375 F oven for 15 minutes or until golden. Boil the tomatillos for 10 minutes. Combine tomatillos, cilantro, scallions and jalapeño in the bowl of a food processor and pulse until desired texture is achieved. Final Assessment: These were delicious and easy to make. The addition of raisins to the filling provided a great balance to the spice and (mild) heat of the chilis. I left them in the oven 5 minutes longer than the recipe called for because I like the pastry to be crunchy and deep golden. The Aji sauce added a tangy zing to the empandas that we all loved - anything with cilantro and tomatillos has to be tasty, right? Thanks, Cathy - and they're baked, not fried! these look great, and I'm new to this interesting project/blog. So it's funny that I stumbled upon the Panama dish first, since I lived there for a year and a half and I really miss the food. You're totally right that it has a diverse population and food culture, but I never had an empanada like this there! The empanadas I knew were a thick corn dough (like an arepa) folded over a small amount of ground meat and deep fried. A complete meal in many parts of Panama would be rice, stewed lentils or kidney beans, and a bit of pan-cooked chicken or beef. Panamanians use a blend of spices (guisos) including a long-leafed cilantro-like herb they call culantro, tiny sweet peppers (ajies), onion, garlic, an nowadays those who can afford it throw in a cube of Maggi bullion. This is from my experience in the central region where the population identifies themselves as "Latino." The mountain populations, indigenous groups, Afro-Caribbean groups, etc. all have unique foods as well. I'm not trying to be critical, I am just interested in how you chose an empanada (something I associate with South America). I encourage you to try some other Panamanian dishes like whole fried fish, rice and beans (check out porotos guisados), patacones, tamales, bollos (like a tamale without any filling, eaten during Holy Week). I love your blog. Great pictures and amazing food. I am making the pineapple vinegar now. I am from the US but moved to India and I love it here. And the food..wow..but there are days we would kill for a hot dog. :) Keep up the good work. I will keep reading and cooking.